Is tech’s tumble a worrying sign? Mark Hibben, who has been following tech stocks on Seeking Alpha since 2013, along with handling his Rethink Technology Marketplace service, thinks the fall presents an opportunity. Also, in this article, Hibben presents his thoughts on the large shifts taking place in the semiconductor sector and what prospects this may present to investors. First, however, Hibben looks at Apple (NASDAQ:AAPL), its decision to report “less” on hardware sales, the company’s tepid guidance, and the way forward for this big tech giant. (Q): Let’s start with Apple (AAPL). The company irked investors with its decision to halt reporting unit sales for hardware in future earnings reports. Your thoughts on the issue? (A): I was very disappointed by the decision. I thought it was a mistake on a number of levels. First, it just makes life tougher for the analyst community in general. Companies such as Gartner and IDC have generally waited until after Apple reported earnings before releasing their smartphone market share estimates. Clearly they relied on Apple’s numbers to anchor their data. The move is unlikely to reduce attention focused on iPhone unit shipments; just the opposite. Rumors and speculation about declines in iPhone sales have been rife in the December quarter for years now. Whereas before, Apple’s data provided a reality check on those rumors, now that check is gone. Rightly or wrongly, the announcement conveyed to many that Apple is expecting an iPhone unit sales decline in the December quarter. Apple’s management seems only able to hunker down in the face of the challenge of maintaining growth in iPhone and overall in the company. The apparent lack of confidence has been deadly for the stock price, but may have played into Apple’s hands as it buys back shares at a steep discount. During the fiscal Q4 conference call, CFO Luca Maestri pointed out that Apple’s competitors don’t release unit sales figures. However, I believe that by virtue of Apple’s size and importance to so many retail investors, Apple is obligated to live up to a higher standard of transparency. It may seem strange to some that I, as a long time Apple investor, should acknowledge this mistake on the part of CEO Cook and company. I don’t try to cheer lead for a company merely because I happen to be long in its stock. I’ve often criticized Apple’s management and will continue to do so as warranted. I see my role as providing the most objective coverage possible of the companies follow, including those I’m invested in. (Q): What about long term and bigger picture? Apple offered tepid guidance for the December quarter. Could we see slowing growth from this company, not only this quarter but long term? (A): Apple did provide rather tepid guidance. Apple guided to a revenue range of $89-93 billion for just 3% y/y growth at the midpoint. This was obviously another disappointment for me and other Apple investors. Apple had the benefit of data from the first month of the fiscal first quarter when it reported fiscal Q4 results on Nov. 1, as well as the benefit of seeing pre-orders for the iPhone XR, which started on Oct. 19. Apple apparently didn’t like what it was seeing. There followed numerous reports of production cutbacks as well as revised guidance for the December quarter from companies such as Lumentum (NASDAQ:LITE) and Cirrus (NASDAQ:CRUS). The problem with these reports is that they rarely state the cut backs in absolute terms. We’re told that production was cut back by X%, but not told from what level. As of the end of November, there don’t appear to have been substantial cutbacks at either of Apple’s main iPhone contract manufacturers, Hon Hai Precision Industries (Foxconn) and Pegatron. Both report monthly revenue and have reported their October and November revenue. In November, when production cutbacks were being reported for iPhone, Foxconn’s revenue grew 5.6% y/y (based on a Bloomberg report). Pegatron’s grew 43% y/y. For the first two months of the quarter, Foxconn’s revenue was up 12.9% y/y and Pegatron’s was up 24.9% y/y. Of course, neither company produces exclusively for Apple, but they usually derive most of their revenue from Apple during the busy December quarter. Thus, whatever “production cuts” may have occurred in November, these cuts don’t appear to amount to y/y production declines. Instead they may amount to throttling back from very high levels the previous quarter, or to revised production plans going forward. I don’t think there’s any danger of an actual decline in revenue or earnings for the December quarter, which the market appears to be pricing in. However, it’s possible that Apple’s y/y percent revenue growth will be less than last year’s 12.7%. This doesn’t concern me overly. Apple has had other periods of slow growth or even declining revenue as it did in fiscal 2016 when revenue actually declined 7.7%. That year, it had a tough compare when revenue peaked at $233 billion for fiscal 2015 on the strength of the iPhone 6 launch. The recently completed fiscal 2018 was the first year that Apple topped its fiscal 2015 revenue at $265.6 billion. Fiscal 2019 will be another tough compare with year-over-year percentage growth probably coming in lower, but I think this is to be expected. Apple’s Services business is likely to continue growing double digits. Last quarter it was up 17% y/y and up 24% for the fiscal year. Apple’s services revenue growth is driven by the growth in its installed user base. Apple’s ecosystem is very sticky, and can grow the user base even in the face of declining unit sales for iPhone or other products such as iPad and Mac. This is because Apple’s device sales bring in more new users than the number of users who drop out of the system. Total iOS unit device sales, composed mainly of iPhone and iPad, leveled out several years ago, and in fiscal 2018 units grew by a mere 0.29%. Yet revenue grew by 15.5% due to higher ASPs. It’s been argued repeatedly that Apple can’t keep “jacking up” the price of iPhone in order to achieve revenue growth. That’s true, but that’s not what Apple does. Apple increases the value of its iOS devices by continually innovating and adding new features. iPhone and iPad continue to enjoy industry-leading performance from Apple’s custom designed systems on chip (SOCs). These have features such as dedicated processors for machine learning, graphics and camera processing. Apple’s iPhone X series and iPad Pro are the only mobile devices to offer 3D sensors for facial recognition. Apple continues to find ways to make its iOS devices more valuable. Could Apple do more? I think it could. We’ve reached the point where Apple’s mobile processors have become as powerful as the Intel (NASDAQ:INTC) processors in many MacBook and MacBook Pro models, but iOS is not really designed to take advantage of that power. I believe that this is holding back unit growth in iOS devices. Apple has come to a critical juncture where it needs to decide where it wants to go with iOS and macOS. I see two different paths forward. One is where it doesn’t enhance iOS further with desktop computer capabilities. In that case, Apple needs to start using its custom processors in MacBook. Such MacBooks would be lighter, more powerful, and have longer battery life than the Intel equivalents. Many believe that this move has now become inevitable. Yet Apple continues to move incrementally along the path of convergence, while continuing to extol iPad Pro as a PC alternative. I believe that Apple will eventually move Mac to its custom ARM processors, but I’m less certain of what Apple will do in the future in iOS. Either of the options I’ve described above would boost device sales. The third major contributor to Apple’s future growth will be from wearables. Apple Watch and AirPods already have contributed to revenue growth, with the Other Products category achieving 35% revenue growth in fiscal 2018 and 31% year-over-year growth for fiscal Q4. Apple will continue to innovate in wearables, and most analysts expect Apple to introduce “smart glasses” as its principal augmented reality platform in the next year or two. Between the three contributors, mobile devices, services and wearables, I believe that Apple’s continued growth is assured for the next five to 10 years. (Q): Chip stocks are taking it on the chin. Nvidia’s (NASDAQ:NVDA) stock has tanked. AMD (NASDAQ:AMD) is much lower than where it was earlier this year. Intel, meanwhile, could possibly be surprising some market observers Your thoughts on the direction of the semiconductor business in 2019? (A): The market has tended to punish semiconductor stocks indiscriminately this earnings season. To a very large extent, the market’s expectations have been conditioned by analyst and media coverage going into earnings. There have been numerous negative outlook reports since the beginning of October. Often, these reports have simply talked about the “chip sector” without making any distinction between various types of semiconductors and semiconductor companies. Consistently, such reports have ignored what I have termed the new paradigm and the roles that companies such as Apple and Nvidia (NVDA) play in this new paradigm. The new paradigm chip companies design their own processors, and integrate them with extensive proprietary hardware and software to produce a finished product. They generally don’t manufacture the chips themselves, but rely on foundries such as Taiwan Semiconductor Manufacturing Company (NYSE:TSM). Much of the outlook for semiconductors has been conditioned by what’s happening in the most commoditized part of the semiconductor business, DRAM and NAND flash. On October 9 Trendforce issued a report predicting that DRAM prices would drop 15%-20% y/y in 2019 and NAND flash would drop 25%-30% y/y in 2019. This codified the already growing pessimism about memory suppliers that has seen Micron (NASDAQ:MU) decline 43% since May 30. Although semiconductor analysts usually make careful distinctions between the various types of chips, the tech media have not been so diligent. Thus, an article titled “No One’s Feeling Chipper About Chips” in the Wall Street Journal made it sound as if the entire sector were in recession, even though the article only talks about two companies, Samsung (OTC:SSNLF) and SK Hynix, and is restricted to their memory businesses. Likewise, a recent CNBC interview with Romit Shah of Nomura mostly focused on Shah’s expectations for the memory market. In the entire interview, Shah only makes one brief statement that he expects slower growth in broader-based semiconductor companies, without getting too specific. Yet the title of the story is “The semiconductor sector is heading to a down cycle.” This is just one example of many of the media’s tendency to over simplify and project the fate of the memory makers across the entire semiconductor industry. Another factor in the tech sell-off has been fear of China and the widening trade war. Those fears were fanned by the media, of which the most egregious example has been Bloomberg’s The Big Hack: How China Used a Tiny Chip to Infiltrate U.S. Companies. The article alleged that Apple and Amazon (NASDAQ:AMZN) and many other companies had been secretly infiltrated by agents of the People’s Republic through modified servers sold by Super Micro Computer. No such modified servers have ever been discovered, and Apple and Amazon have called upon Bloomberg to retract the story, but it has yet to do so. The article effectively smeared any technology company that relies on Chinese manufacturing. After all, if the Chinese could hack Super Micro’s servers, what was to keep them from hacking other devices made in China for U.S. companies? The general negativity about China and fears of Chinese retaliation against U.S. companies have caused the market to react even more negatively against the new paradigm companies, which often rely on contract manufacturing in China. In this context, the old paradigm chipmakers such as Intel and AMD have fared somewhat better by virtue of being less dependent on Chinese manufacturing. This does not affect my long-term outlook that the new paradigm represents a better business model. Apple and Nvidia have been able to make great strides in their respective processor design efforts, as Intel has seemed to stand still in CPUs and AMD has stood still in GPUs. On Nov. 26, Amazon Web Services announced in a blog post that it would begin offering cloud services based on its custom designed ARM server processor, called Graviton. This marks the first large-scale adoption of the ARM architecture for server use. This also marks Amazon’s official entry into the ranks of the new paradigm. The chip was designed by engineers from an Amazon acquisition, Annapurna Labs. By integrating its custom hardware and software, Amazon has created a unique “product” that it now offers to customers as a cloud service. The handwriting should now be on the wall for all to see. The days of the old paradigm chip suppliers such as Intel and AMD are numbered. I continue to look for investments in new paradigm companies and related suppliers. (Q): Specifically on each stock – still bullish on Nvidia? Dubious on AMD? What about Intel? Any other semiconductor stocks worthy of investor attention? (A): Nvidia is my favorite new paradigm company. Nvidia has made enormous investments in software in order to make its CUDA development environment essential for machine learning and high performance computing. This is part of the reason that Nvidia’s most powerful GPU accelerator, the Volta V100, was chosen to power the world’s fastest supercomputer, Summit, at Oak Ridge National Laboratory. Nvidia has come to dominate the top tier of supercomputing. Nvidia’s ARM SOC development is spearheading Nvidia’s thrust into autonomous vehicles and intelligent robots. Nvidia’s latest Xavier SOC combines ARM CPU cores with Nvidia’s latest-generation Volta GPU cores and special hardware acceleration for machine learning. Xavier is the basis for numerous autonomous vehicle development efforts at companies such as Daimler and Toyota. Nvidia’s ARM SOCs also are the brains of the Nintendo Switch, and I believe that Nvidia will eventually become the platform of choice for similar consoles in the future. Through its ARM SOCs and high-performance GPUs, Nvidia will almost completely dominate computer gaming. Nvidia’s Turing architecture is a breakthrough that provides real time ray tracing for computer games. No other manufacturer can claim to be able to provide real time ray tracing in a single GPU. Nvidia’s Turing supports Microsoft’s DirectX Raytracing (NYSEMKT:DXR) APIs for game development. Eventually, all new Windows PC games will utilize this technology. AMD’s Senior Vice President of Engineering at Radeon Technologies Group recently acknowledged the significance of DXR while making a face-saving claim that AMD would offer its own implementation of DXR. He did not, however, state when this would be available to consumers. I believe that it will not be possible for AMD to implement DXR without infringing one of the numerous patents Nvidia has on its hardware approach. I doubt that Nvidia will be willing to license its patents, leaving AMD with no means of implementing DXR. For all practical purposes, it’s game over for AMD in GPUs, although investors don’t realize this yet. I expect AMD to eventually spin off or sell Radeon in order to focus on CPUs. The most likely buyer for Radeon would be Intel. Much of Radeon already has moved over to Intel with the Koduri defection. By selling what’s left to Intel, AMD would at least realize some revenue from its intellectual property pertaining to GPUs. (Q): On cryptocurrency, your view of the impact on tech, specifically companies like AMD and Nvidia? How about cryptos in general? (A): Both AMD and Nvidia benefited from the crypto currency mining boom in 2017 for currencies that were GPU-mineable, Ethereum, Zcash and Monero. However, by mid 2018, GPU mining capacity was no longer expanding very much. With demand for new mining cards falling, both companies declared the crypto boom over by their fiscal Q2 earnings reports. Therefore, it’s a little strange that Nvidia found itself with excessive channel inventory for its lower priced (GTX 1060 level) graphics cards when it reported its fiscal Q3 results. This glut appears to be poor inventory management on Nvidia’s part and will take one or two quarters to work through. However, I don’t expect a long term impact. 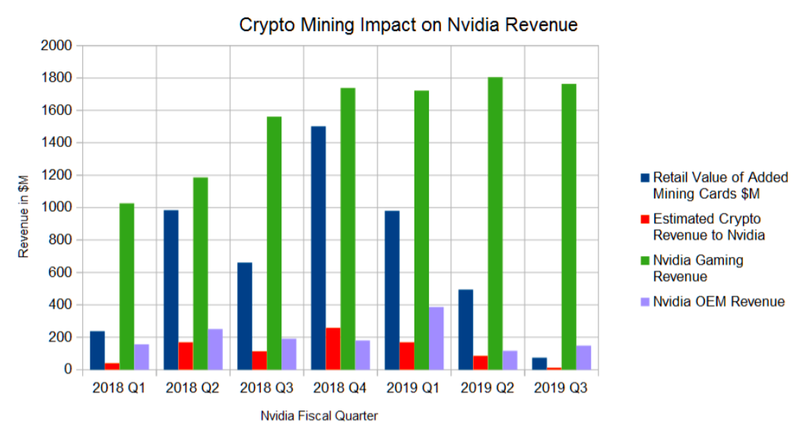 The notion that Nvidia’s revenue growth in its Gaming segment was fueled by crypto isn’t supported by the facts. Even as crypto mining demand dropped off starting in calendar 2018, Nvidia’s Gaming segment continued to post robust growth. There just wasn’t enough growth in mining to account for this, as I pointed out in a recent article. Although the retail value of total mining card sales was fairly high as of Nvidia’s fiscal 2018 Q4 (ending January, 2018), the actual revenue to Nvidia was fairly small. This was due to the fact that the mining card market was split roughly 50/50 between Nvidia and AMD, as well as to the fact that Nvidia only realized the revenue due to sales of its GPUs to its add-in board partners. In general, I still see crypto as a novelty that mainly appeals to those who wish to speculate in digital assets or conceal monetary transactions for whatever reason, rather than as a generally useful currency. Crypto currency represents an interesting technology looking for an as yet undiscovered killer application. Unfortunately, blockchains, as a way to perform transaction processing are grossly inefficient compared to traditional transaction processing such as credit or debit cards. Ultimately, I expect national governments to adopt digital currencies as a way to reduce the cost of producing physical currencies. However, transaction processing will be performed in a manner more akin to today’s credit cards, with banks delegated that role by national governments. (Q): When taking a general view, tech has struggled as an investment during the last half of 2018. Your thoughts on the sector in 2019 and beyond? (A): Taking the longer view, I believe that the market downturn has created enormous opportunity for tech investors. I’ve been buying Rethink Technology Portfolio companies during the downturn and plan to continue to do so. I expect the trade war to be settled eventually, taking the pressure off the new paradigm stocks that have extensive production or business activities in China, such as Apple and Nvidia. The growth thesis for the new paradigm companies is fundamentally unaffected by the trade war, assuming that it gets settled in the next year or so, which I consider likely. (Q): Which domestic and/or global issue is most likely to adversely affect tech stocks in the coming year? (A): Obviously, if the trade war isn’t settled in the coming year, this will be a drag on the companies with significant China exposure. I’m looking to diversify the RT Portfolio to include more companies with less China exposure. (Q): What’s the big opportunity for tech in 2019? Nvidia. Since its GPUs are manufactured in Taiwan by TSMC, it has relatively little direct exposure to the trade war. Add-in board partners that use Chinese contract manufacturers are the most exposed, and this could affect Nvidia’s chip sales to them. Both Nvidia and the add-in board makers have the ability to rotate manufacturing out of China, if that becomes necessary, although this might produce some short-term supply chain disruption. So I don’t consider Nvidia particularly vulnerable to the trade war, no matter how long it continues. As it stands right now, Nvidia has become grossly undervalued. I consider that Nvidia is selling for about half its fair value. There’s no better bargain in tech. Disclosure: I am/we are long AAPL, TSM, NVDA.